Last night I went to see the preview of a new arts event taking place at Brockhole near Windermere. It’s called ‘Flight’, and explores our fascination with flying, and a side to the First World War we don’t often talk about: the loss of life in the Royal Flying Corps, also known as the ‘Suicide Club’. The use of the term ‘Suicide Club’ was a reference to the very low life expectancy of those who served on flying missions – a surreal average of just 11 days, when flight was still in its infancy. 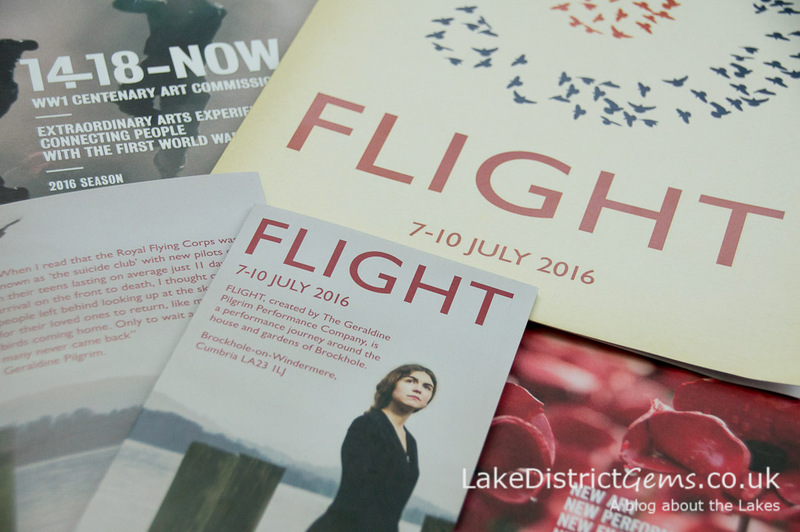 Flight is a collaboration between Lakes Alive and The Geraldine Pilgrim Performance Company, and a part of 14-18 NOW, the UK’s arts programme for the centenary of the First World War. The promotional leaflet refers to Flight as a ‘performance journey’ around the house and gardens at Brockhole, and it looks not just at the loss of life directly, but how this affected loved ones who were left behind. I had trouble imagining how the journey would work in practice, so it was absolutely fascinating to see, and I haven’t experienced anything like it before. First, my designated group was led upstairs inside the main building. Here we saw an exhibition of images which had been taken at Brockhole in its former life as a house, and in the years before war broke out. We also read descriptions about the house, its occupants, and the well-known designer of Brockhole’s Edwardian garden, landscape architect Thomas Mawson. Mawson’s own story is sad, as he lost his son during the First World War. Afterwards, he threw himself into his work to create a self-supporting village near Lancaster for returning soldiers who were now disabled, and their families. Following a look round at these photos and other historic items related to flying during the First World War, we were led downstairs and out onto Brockhole’s front terrace to the sound of aeroplanes. There weren’t really any planes of course, but hidden speakers were giving a very good impression that they were flying right overhead! Our group was then led through Brockhole’s garden and grounds, where over 100 volunteers in small groups and a variety of settings were dressed in what soldiers and airmen, and their relatives, would have been wearing at this time. Whereas we’d all set out chattering away, everyone in the group suddenly went quiet. As we walked slowly around Brockhole’s pathways we saw ladies in white lace dresses seated in the garden waiting, young ladies waving their men farewell, airmen in uniform, and a pilot brooding over a cup of tea while a clock tick-tocked away in the background. In one scene we saw a lady receiving a telegram with the worst possible news (a sort of mini dramatisation which took no more than a few seconds as we paused briefly before continuing to follow our guide). We also saw the young lady in mourning, as shown on the front of the Flight leaflet – she stands at the end of one of Brockhole’s lakeside jetties – and there were many more scenes besides. Several speakers hidden around the grounds played music from the period, whilst others produced atmospheric and often quite eerie sound effects. //platform.twitter.com/widgets.jsFlight is a fascinating event (it’s actually quite difficult to describe what it is really – a journey, event, living art installation, dramatisation? ), with volunteer actors from various organisations and the local community, and just one professional actress. The co-ordination whereby each group of volunteers acted out their individual scene just as the tour group walked by was amazing, as was the use of sound-effects, which at times were quite haunting. Flight is on each evening until 10 July and lasts for about an hour, including time spent looking at the exhibition. A Flight exhibition will also remain at Brockhole from 11-15 July, open from 10am-5pm each day, and will be free to visit. Here you will be able to see a series of installations around the house and gardens and a recording of the performance (take a look at the Lakes Alive website for performance times and details, and also bear in mind that Brockhole has pay-and-display parking). If you can make it to a live performance, then I would urge you to do so, as it is something very worthwhile experiencing. It really tapped into a part of history that has stayed with me since I studied poetry and literature from the First World War for my English Literature A level – again though, this focused mainly on life in the trenches, so it was interesting to explore a different side to the war experience. There are a couple of interesting articles which give more background to just how terrible the loss of life was in air combat during the First World War – something I didn’t know, for instance, is that over half of those involved in flying actually died in training because the technology was so new. You can read more on the BBC website and at The Guardian online, and watch the video with Geraldine Pilgrim below. Lakes Alive asked for feedback at the end of the evening, and for each of us to describe our experience in just three words. I really only needed two: ‘incredibly moving’. Lakes Alive has hosted lots of arts and cultural events in the Lake District in recent years. Is there one memory that particularly stands out in your mind from previous events you’ve seen? If so, you can share it with other readers of the blog by leaving a comment below – as always, it would be lovely to hear your thoughts. Lakes Alive are running a weekend of events in Kendal on August Bank Holiday (26-28 August), so put the dates in your diary!